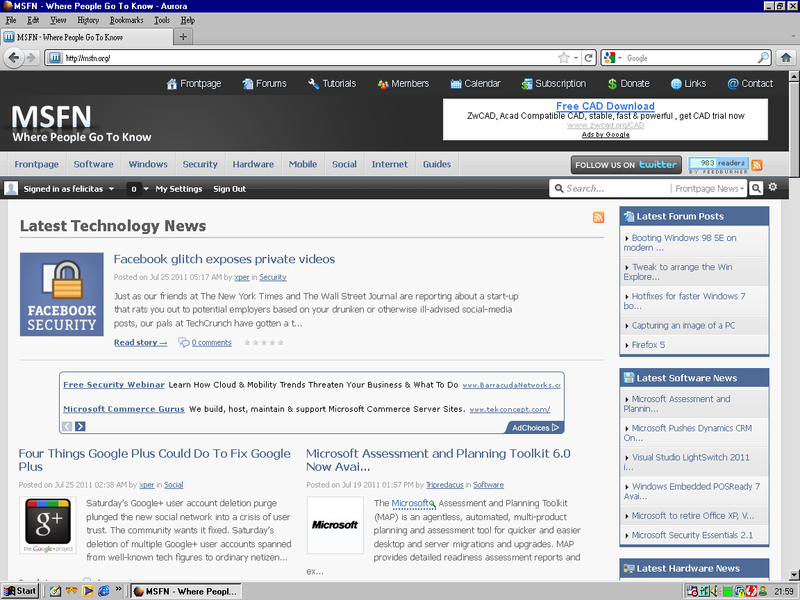 This is a build of Firefox 7.0 optimized for running on Windows 98 and higher using KernelEx 4.5.1. Why not use the regular build? Mozilla's official version, or rather their integrated SQLite3, triggers a bug in KernelEx when using Write-Ahead Logging, which causes massive slowdowns, rendering Firefox useless. This version features a workaround for that problem. It just disables use of WAL. This bug was discovered and reported by aceman, see http://sourceforge.net/tracker/?func=detail&aid=3284681&group_id=255038&atid=1126916. As this is a modification of Firefox, it is licensed under the very same terms, which means MPL(Mozilla Public License)1.1/GPLv2, LGPLv2.1. These licenses basically allow you to use, modify and share the software freely, as long as you also redistribute any source code modifications. See the respective licenses for more details. In case you want to compile Firefox yourself, download the following patch. It contains all changes made. Applies to Firefox 5.0 source. Feel free to mirror everything. All binaries provided here are compiled using Microsoft Visual C++ 2008 SP1. Build instructions(https://developer.mozilla.org/en/Build_Documentation). You will need a recent version of Windows to compile it. The binaries above were created on Windows 7 SP1. Tested on Microsoft Windows 98 FE/Gold(4.10.1998) and KernelEx 4.5.1. 1. Bookmarks and History do not work at all. This will wipe out all your bookmarks of all older Firefox versions! Steven W found a way around that using PlainOldFavorites Addon. See . 3. Menu fonts look somewhat strange. Is there a missing font? Or maybe it’s related to that new font rendering stuff that everyone was complaining about? I don’t know. 4. WebGL might not work. I’m currently unable to test 3D functionality. Firefox was compiled without DirectX SDK being installed though. While Firefox itself is open-source, the name “Firefox”, the Firefox logo and related stuff are not. Mozilla prohibits the use of the name “Firefox” as soon as the source code gets changed to ensure consistency for users. 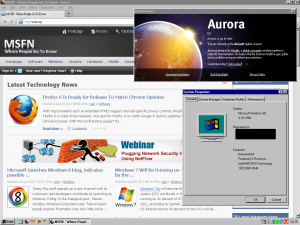 Aurora is just the default name for unofficial builds. See http://www.mozilla.org/foundation/licensing.html for more information. Will this fix get into official builds? Hopefully not. It is just a workaround, or a hack. The problem does not lie in Firefox or SQLite, but rather KernelEx. We should fix KernelEx to finally get rid of that bug. It might also affect other applications. The reason for this build is simple: It’s just easier in this case to modify Firefox than debugging KernelEx. The first look is very good and the menu fonts doesn't be strange, but I can't import any bookmarks from other browsers. Sure. I've added Megaupload, just have a look at the first post. Hope that works better. To be honest, I've never tried importing bookmarks =D. May be another KernelEx bug, or maybe something is strange with my version. Maybe I'll get some time to take a look at this. Thanks I got it working. Pretty slick, I love that it don't have the bells and whistles a.k.a bull$*!+. Its just simple. I might give up opera for this. Do you think we should upgrade to the latest version or should we work on this version getting it close to flawless? Firefox 5.0 is the latest release for Windows. 5.0.1 just contains some fixes for Mac OS X users, so using it wouldn't make any difference. See the changelog at http://www.mozilla.com/en-US/firefox/5.0.1/releasenotes/. There isn't any reason for not updating to 5.0.1 though. I guess I'll update it in the next few days. In general, I will try to update the binaries to the latest stable release as soon as possible, which is 5/5.0.1 at the moment. 6.0 will be released in a 2-3 weeks if I remember correctly. I would prefer fixing KernelEx much more, enabling us to use official builds again. I'm digging into the code right now, to some degree at least. Hunting down the exact reason isn't as easy. Let's see how it turns out. Then you should volunteer to be a KernelEx developer. Xeno86 has just asked for help. I'd be very glad if you accepted. The only problem is official build aren't optimized for older CPUs like palemoon and have massive memory leaks witch palemoon trys to address. I hear FF7 has the leaks fixed though. I saw an article benching all the browsers and FF and opera used over 100mb ram and IE not far behind but, chrome was using 30mb ram. I wanna see chrome ported over too 98se and kernel ex. 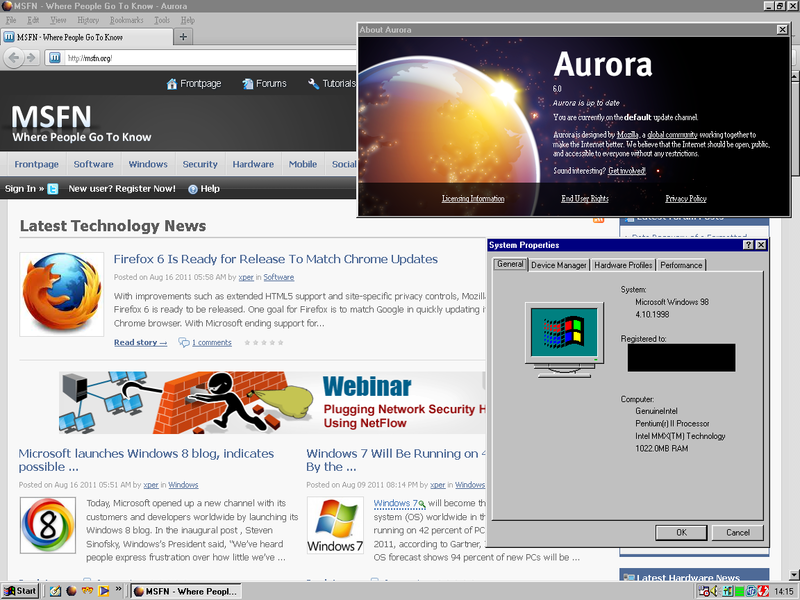 or if kernel ex could run chrome that would be cool too. Wrong. Palemoon is highly optimized for modern processors. I confirm, that bookmarks can't be stored and imported. Of course after the installation, the other Firefox versions lose their bookmarks. All versions use the same "profiles" folder. Fortunately Firefox have backups of the Bookmarks. Not as responsive as Opera, but doesn't have the random communications errors of Opera, either. History doesn't work (brings up a page called "Library" instead). Java doesn't work (same problem as with Opera) : "Before Firefox can run Java applets you must have the Java plugin properly installed and enabled. 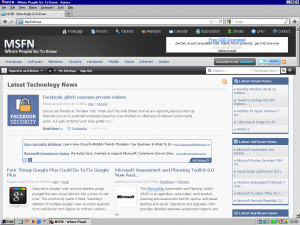 Firefox also requires the new Java plugin included in Java 6 Update 10 or above." I transferred plugins from 3.6.19 like GoodOldFavorites and VistaAreo. But yeah, I like the tabs on top and the app button. It could be made official if you made this function an IF statement.